Naviga have said that it WILL be an Naviga FSR Worlds in 2015 in "Germany" but so far nothing is made official by them to prove it. "I am urging all countries to attend the Championships organised by FSR World in Dessau this August. After hearing nothing from Naviga on what plans they have for the next FSR world championships. I have put FSR World in contact with the UIM to see if there can be some sort of union between them. The UIM are still working on the possibilities of ways to combine and will send a representative to Dessau. At Dessau there will be a large meeting for all FSR racers which hopefully will decide the future of FSR in the way the racers want. At the meeting if everyone wants a committee will be set up to run future Championships and anything else required. 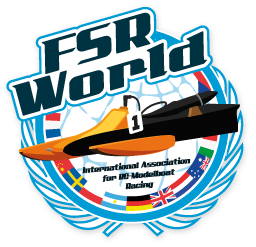 For the championships this year FSR World have agreed entry must be from all countries federation’s not private individuals. There will be no fee to join anything, only the racing fee’s to be paid. Entry will be allowed to only one federation from each country. They can be affiliated to FSR World, Naviga or UIM. If your country's federation will not send a team another federation can be set up and a team will be accepted from them. The future is in your hands I think it is important to attend this event. I have not taken this decision lightly but after going to Naviga European and World Championships for the last 40 years and meeting my wife at a championships I feel Naviga this time have really let us the people who race and attend the events down. FSR-World has also been in contact with UIM to become an "Contract Promoter" but UIM have not yet made any decisions.